Can you let that story go? Last week, my sweet Aunt Millie was hopping mad. She called me at 7:00 am from her assisted living facility. I sighed. We went through this last year when she and her sister, my 99-year-old aunt who lives in the same facility, had gotten into a spat. She wants to move whenever any bit of stress crops up. When you’re 97 and living in close proximity to twenty-five or so other nonagenarians, there are apparently plenty of opportunities for hurt feelings. This time a new resident parked her walker behind Aunt Millie’s chair in the dining room. Aunt Millie politely asked her to move it. The new lady refused. She might have even smiled slyly. It took about ten minutes to unravel the fact that Aunt Millie meant her complaint, not claim. She’s a little confused sometimes and doesn’t hear well, so there was some shouting, too. I patiently tried to explain to Aunt Millie that there were no other places as nice in our budget and that I couldn’t take off three weeks like I did two years ago to get her moved. Nursing home regulations require doctor’s exams and reports and when you’re 97 and have multiple medical issues like she does, that’s a lot of doctor visits and reports. “And we’d need a truck and people to move your furniture,” I added. I sighed again and told her I’d think about it and call her back. I hung up and began to grumble in my head. Why me? Why am I always the one she calls? Why does she always have to react like this? Ugh. I can’t believe this. Why does she always have to call so freaking early? She’s not moving and I’m not going to drive five hours up there to explain it to her. Again. I picked up my phone and began to text my cousin, to let her know that there was another incident. Another crazy request. One. More. Thing. Later, I’d tell my friends, too. What a sacrifice I was making! What B.S. I put up with! What a wonderful niece I am! Ugh. Ugh. Ugh. I felt my stomach tighten. Halfway through the text I looked up. The sun was shining and a light breeze was blowing through the palm fronds in my back garden. 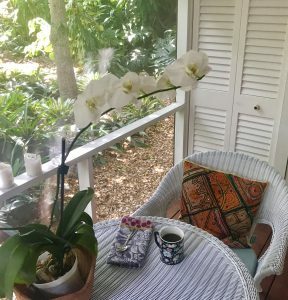 There was an orchid blooming on my back porch. I’d just made a pot of fresh coffee and could smell it. A little pan of steamed macadamia nut milk was ready to add. I didn’t need to text my cousin. She didn’t need to know what had happened. We weren’t going to move our aunt. I poured a cup of coffee, added the milk, and took it outside. I breathed deeply and looked at the bright green around me. The tension in my belly relaxed. I’d call the facility administrator later in the day to make sure my aunt had calmed down and that the parking rules for walkers was explained to the new resident. That was all the situation required. I’d been on the verge of “story fondling,” Martha Beck’s description of unnecessarily keeping an unpleasant situation alive by retelling the story over and over. I’d momentarily wanted to milk the full drama out of this, which would only keep me aggravated and perhaps get my cousin stirred up too. All I really needed to do right then was to savor my coffee and enjoy the quiet morning. I had been right on the verge of ruining my morning when I came to my senses. I’m sure you have your own version of “Aunt Millie wants to move again.” Most of us do. Maybe your friend canceled dinner plans at the last minute again. Do you really need to stew about it all evening or complain about it to another friend? Really? Maybe the traffic made you late to an important meeting and you charged in feeling frazzled. Do you really need to keep telling yourself that you probably looked ridiculous? Do you really need to keep worrying about the impression you made? Are you sure? Maybe you sprained your ankle and you’ll be on crutches for a couple of months. Do you need to tell everyone you encounter how clumsy and stupid you were? How much weight you’ll gain since you can’t go to the gym? Is that going to make you feel better? What if you could just let it go? Just stop and breathe and look around for the beauty that is pretty much always somewhere nearby. Whether you can sit outside or sit by a window or look at the beauty of the faces of the people or pets you live with, there is always something else better, more nourishing to focus on. There always is. When I catch myself hanging onto unnecessary stories, maybe finding drama in ways that make me feel worse, and I let it go, my whole system settles down. My day can open into a possibility, a creative idea, or a bit of magic just waiting to be discovered. We don’t have to hang onto our unpleasant stories. Truly, we don’t. Take a breath. Look at what’s around you. Let the story go. If you live in New York City, you probably ride the subway. Suzanne, New Yorker I coach, absolutely despised her commute. She complained bitterly about the griminess, the overcrowding, the behavior of the other riders. It was absolutely intolerable, she told me. Her commute took 45 minutes each way. That’s more than 32 hours every month, a long stretch of misery in a life. She considered moving closer to work, even changing jobs, but couldn’t come up with a practical solution to the problem. I had an idea. “Begin looking for beauty on the subway,” I suggested. 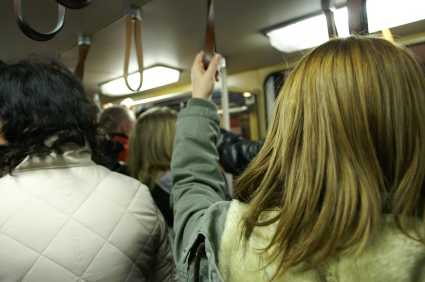 Suzanne laughed cynically and patiently explained to me—a non-New Yorker—what was patently obvious to anyone with two eyes, a nose, and a brain: the New York subway is a human cesspool during weekday rush hour. It was impossible to appreciate anything about it, and there was certainly no beauty to be found there, she assured me. But I insisted. “Send me an email every day, telling me of the glorious, beautiful, amazing things you find on the subway.” Suzanne left our session muttering that I’d given her an impossible assignment. How about you? Is there anything ugly, disgusting, intolerable in your life? Can you see it with new eyes? What if you had a time machine that transported you to a time when you were younger, healthier, and more vibrant? A Harvard psychology professor, Ellen Langer, wondered and created a study to find out. She took a group of 75 year olds, and tested them for a bunch of typical signs of aging, like hearing, eyesight, flexibility, and so forth. Then she took them on a retreat where they were given one instruction: think and act like you did when you were 55 years old. The setting at the retreat helped create the right mood–the music, the magazines, and newspapers they saw and heard were all twenty years old. Two weeks later, the participants were retested and their signs of aging had all improved, including a 10 per cent improvement in their eyesight! They looked younger, their joints were more flexible, and their posture straightened. Even their fingers, which typically shorten with age, actually lengthened. Talk about creating your own reality! This story is so captivating, that it’s going to be made into a movie starring Jennifer Aniston. How can you apply the lessons of this study to your life? What if you thought, acted, and felt like your life was full and rich, like your health was vibrant, and like your relationships were happy and loving? What would happen? Try this exercise. Think of an area of your life that you want to change. Climb into your personal time machine that transports you to a time, past or future, when you have or had what you want. Then think, act, and feel as though you have that improvement right now. Really feel it in your body. Use your imagination to visualize it. Journal about it. Touch it, smell it. Listen to the music that you would listen to if that life existed right now. Be grateful for having it. You’ll be amazed. Happy travels! Karen was ecstatic. She was tired of being single and sent an email to an old boyfriend. He immediately returned the email and told her he was single, too. He wanted to see her. They spoke and made a date for the following weekend. I asked her to describe her excitement. “It’s the feeling of being loved,” she told me. “Where did that feeling come from?” I asked. “From his call,” she said. “Oh, did he tell you he loves you on the phone call?” I asked. “So, where did the feeling of being loved come from?” I asked. “It’s in my heart,” she said. “So where is the feeling coming from?” I asked her. “Oh my gosh, it’s coming from inside me!” she exclaimed. Yep. That’s it. That’s the secret formula. When Karen thought the possibility of being in a loving relationship was on the horizon, she felt good inside. She became happy and excited. Before that, life was ho-hum. She hadn’t seen this guy in years, and all that had happened was one phone call. The old boyfriend didn’t do that. Karen did–she transformed the way she felt about herself. So, as Karen discovered, being excited and feeling loved can be generated inside of us. Once we “get” this we can create it for ourselves, over and over, every day of our lives. We can just skip the middleman (in this case, the old boyfriend) and create the feeling of being loved and the excitement of looking forward to life within ourselves. So next time you are feeling fabulous, really explore it. Get to know this place. What do you feel? Where do you feel it in your body? Describe it. Write it down. What thoughts are you having about yourself? Write them down. Memorize everything you can about this experience. We don’t have to wait to find the right relationship or the right anything else to feel fabulous. And, as a bonus, when we’re excited to be alive, we can attract exactly what we want–like a great relationship! Thoughts Coming at You Like a Runaway Train?